The first issue of the five-part Assassin’s Creed miniseries Trial By Fire wasn’t earth-shattering. It felt a bit rushed and confused, ushered along at a breakneck speed to make sure the reader was able to cut to the “good parts” almost immediately. #2 slows things down a bit, but many of its core problems persist. Throughout the majority of the issue, Charlotte de la Cruz remains in the memory of her male Assassin ancestor, watching and experiencing firsthand all of the things he does while attempting to recover a much-needed mystical piece of Eden. Charlotte’s ancestor, Tom Stoddard, is a pragmatist. He’s efficient, brutish, and without much by the way of empathy. 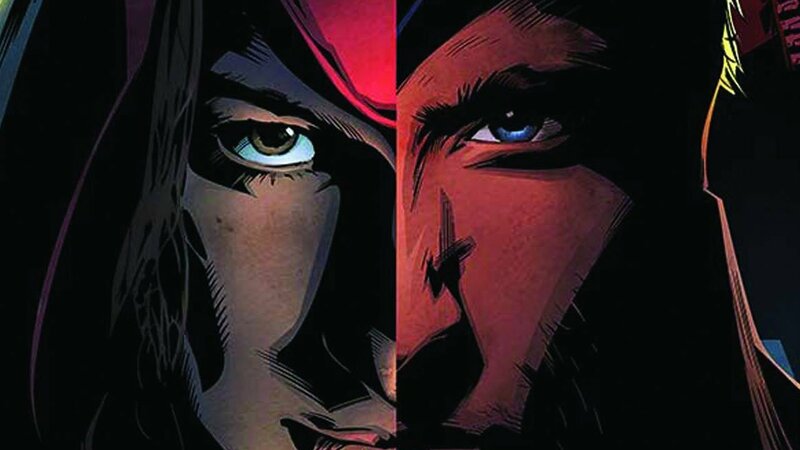 In this arc, he’s forced to reluctantly join with the ancestor of another modern-day Assassin, a young woman who has been posing as a nurse to help protect and better understand the young women who have been accused of being witches by their paranoid puritanical neighbors. Their investigation eventually leads them into a Templar underground hideout filled with captives, and Tom wastes no time in threatening many of them to find out where this ever-evasive piece of Eden is located. After a series of tense moments, he and his rookie partner make a strange discovery about their mission’s objective. Issue #2 is a consistent flow of expository dialogue insistent on making sure the reader understands every facet of each fact presented in its entirety. In fact, so much effort has been put into making sure the reader knows what’s going on that the writing often steps into hand-holding territory. While in Tom’s memory, Charlotte is still able to cue in and talk about certain aspects of the mission, frequently commenting on the reactions of other characters and the world. While this could have led to some interesting development on the part of Charlotte, it’s instead used as a somewhat annoying obvious audience surrogate. Her entire inner monologue is little more than a voice given to the questions that naturally appear in a reader’s head. Worse, it tells people how to feel and what to think about a particular moment. This is compounded by yet another Animus freak-out moment, where Charlotte again tries to control the actions of her ancestor and freaks out all of the home base people in modern times while the standard tech geek continues to report on her vitals. And of course, this leads to a heated discussion about whether or not Charlotte’s ready for this job, about how great of an assassin Tom Stoddard was, about the pressures the Brotherhood faces should she fail. It’s more of the same, not adding much more to the story in this second issue than a few new details about Tom’s actual mission in Salem. While some of the visual layout design was a bit jarring, the art in issue 2 is superior to that of 1. Action has a nice amount of fluidity to it, faces feel distinguishable and believable, and the liberal use of thick shadows adds an edge to the Assassin’s already-faithful looks. Expository dialogue and hand-holding aside, this miniseries’ biggest challenge is taking enough time to develop characters and make them interesting in their own right. Were it to slow down a bit and explore the motivations and personalities of each person on the page beyond what we already know, the events portrayed would likely carry more weight, significance, and substance. 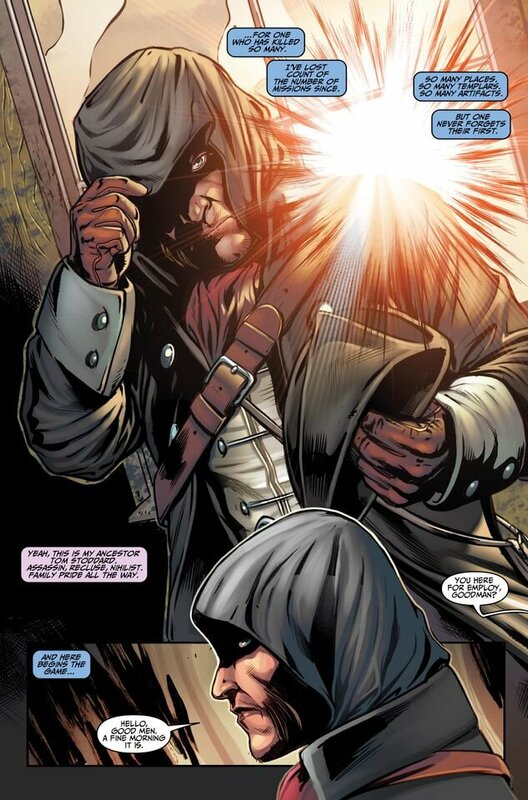 Assassin's Creed #2 is a consistent flow of expository dialogue insistent on making sure the reader understands every facet of each fact presented in its entirety.